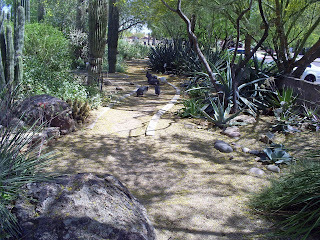 I live Glendale, a suburb of Phoenix, Arizona, which is in the Sonoran Desert. Most of the year the weather is glorious. It never snows here, the sun shines just about every day. I think the Chamber of Commerce says 360 days a year, but it may be only 359 days. People come from all over the world to visit the resorts here, and to play golf. But for three to four months of the year, it's insanely hot. And surprisingly, that's an advantage to people like me. I've lived where the weather is nice all of the time, like Southern California, and have seen some very serious drawbacks. Of course, if you've only lived in wealthy neighborhoods, this won't matter, but I've lived in some, uh, sketchy, places. And while my house in the suburbs is pretty respectable, I'm certainly not one of the "rich folks". Harsh conditions means that a fair amount of upkeep is needed on your house just to keep it comfortable. In Southern California, you can have everything from broken windows to great big cracks in your wall, and it really won't make all that much difference. Especially in Santa Barbara, where I lived for a couple of years. And where the weather is always nice, you don't need air conditioning, or heat, in your car or house. Except when you do, and you don't have it. I have been the most miserable in my life when the Santa Anna winds drove up the temperature of my un-air-conditioned apartment in Santa Barbara. And did I mention how difficult is is for someone like me to sleep when it's cold? Yep, no heat in that apartment, either. And the gas wall heater that I had in my place in the San Fernando Valley of Los Angeles might just as well have been nothing but sound effects. It just went "bang-bang!" and didn't really warm up the place. I left it off and slept under an electric blanket. Getting out of that bed on cold mornings was excruciatingly painful. Here in Phoenix I have a 5-ton air-conditioning unit on the roof of my house. I have double-insulated windows. I am outrageously comfortable. My car was made by the nice people at General Motors, and the air conditioning is fantastic. I have expensive shades on my windows. I have a nice garage, where I park my car. Even the doggy door is double-insulated. And I can do all of these things without appearing eccentric. In Southern California, this level of investment in comfort would seem absolutely ridiculous for a modest house like this. Here, it's a necessity. Image above: Walking through the cactus garden at the Glendale Main Library, 59th Avenue and Brown (just south of Peoria).